Botox Injection distributors, dealers & suppliers in Mumbai. Botox is a drug made from a neurotoxin produced by the bacterium Clostridium botulinum called botulinum toxin injection. It is used medically to treat certain muscular conditions and cosmetically remove wrinkles by temporarily paralyzing muscles. •	Botox Injection in Mumbai is the most popular cosmetic surgery treatment, with more than 6 million Botox injection Mumbai treatments administered each year. •	People also use Botox injection to treat excessive sweating, migraines, muscular disorders, and some bladder and bowel disorders. 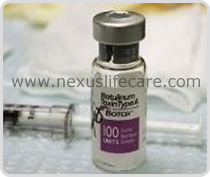 •	Just one gram of botulinum toxin injection could kill over a million people. Two kilograms could kill the entire human population of Earth. STRENGHT:-50 units , 100 units and 200 units. BENIFITS:-Botox Injection helps in removing wrinkles, it minimizes the look of crow’s feet , and is also helpful in the treatment of migraine headaches. •	Botox Injection may cause bruising, bleeding, pain, redness, or swelling where the it was given. •	Botox Injection may cause headache, tiredness, muscle stiffness, neck or back pain, pain in your arms or legs. •	Botox Injection may also cause dry mouth, blurred vision.